SanDisk is to add a 8GB SDHC memory card to its Ultra II line-up in June, but it's already sowing the seeds of confusion by claiming a range of speeds for the card in addition to the standard SDHC rating. SanDisk said the card's SDHC speed Class is 4, guaranteeing a 4MBps sustained data transfer rate. The company claimed the SDHC speed grades are keyed to applications like real-time video capture, so it also quoted its own figures: a read speed of 10MBps and a write speed of 9MBps. Lexar did the same thing last month. Its 4GB SDHC card has a Class 6 - 6MBps - rating and a Lexar-claimed sequential write speed of 20MBps. The SDHC speed ratings were supposed to impose a simple, standardised way of comparing different cards' performance, but it looks like consumers will have to get their heads round a host of other numbers too. SanDisk also announced a 4GB Class 6 SDHC, part of its Extreme III range, which also has a 20MBps sequential read/write speed. It's due to go on sale in April, as is a 4GB Extreme III Memory Stick Pro Duo card, which has an 18MBps read/write speed. Neither SanDisk SDHC card shows its SDHC speed rating. SanDisk's Ultra II card will go on sale in June with the company's MicroMate USB adaptor for $240 in the US and around €121 in Europe. 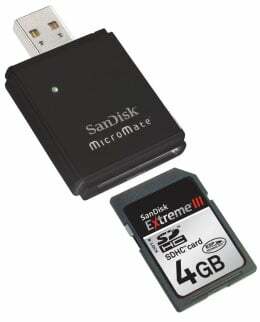 The Extreme III SDHC card also comes bundled with the MicroMate and is priced at $140 (£73/€107). The Extreme III Memory Stick Pro Duo will cost $180 (£93/€137).